Easily integrate this legal flatbed scanner into a document management system. Get rapid scanning and reliable paper handling with HP EveryPage technology. Workgroups can enhance scans with a suite of comprehensive scan software. Scan books, ledgers, notes, cards and more using this legal-size flatbed scanner. Scan up to 50 ppm with up to 600 dpi resolution. Scan books, ledgers, notes, cards and more using this legal-size flatbed scanner. 8 1/2" x 14" maximum scan size. 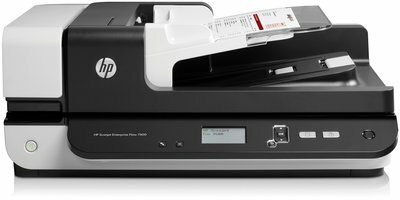 Automatic document feeder copies/scans multiple pages at once. Customize scanning profiles and easily access them, using the 4-line LCD display. Simplify tasks with HP Smart Document Scan Software and automatically enhance images for ideal scans. Seamlessly integrate this scanner into existing workflows, using full-featured drivers. Optimize scans with built-in OCR capabilities, then save in a variety of file formats. Select from several scan-to destinations. Add metadata for easy search, archiving and sharing. Scan with confidence—HP EveryPage technology keep scan projects running smoothly. Easily monitor the system specs and status of your scanner using HP Web Jetadmin. Compatible with Windows XP, Vista, 7, 8, 10 and Mac OS X 10.9, 10.10, 10.11. Get fast scanning and excellent image results. Get fast, reliable scanning—up to 50 ppm/100 ipm with 200 dpi in black and white, grayscale and color. Easily integrate and improve document management. Simplify scanning tasks with HP Smart Document Scan Software and automatically enhance images for ideal scans. Count on HP reliability and save valuable time. 1 Requires an operating system with power management capabilities, such as Windows 8 or Chrome.